Sewn as a Site project on the cover of Artikl magazine! ..”as if it had been left by aliens during their departure from our planet”… a review on the Prague exhibition in the recent issue of Flash Art magazine by Marketa Hrehorova. 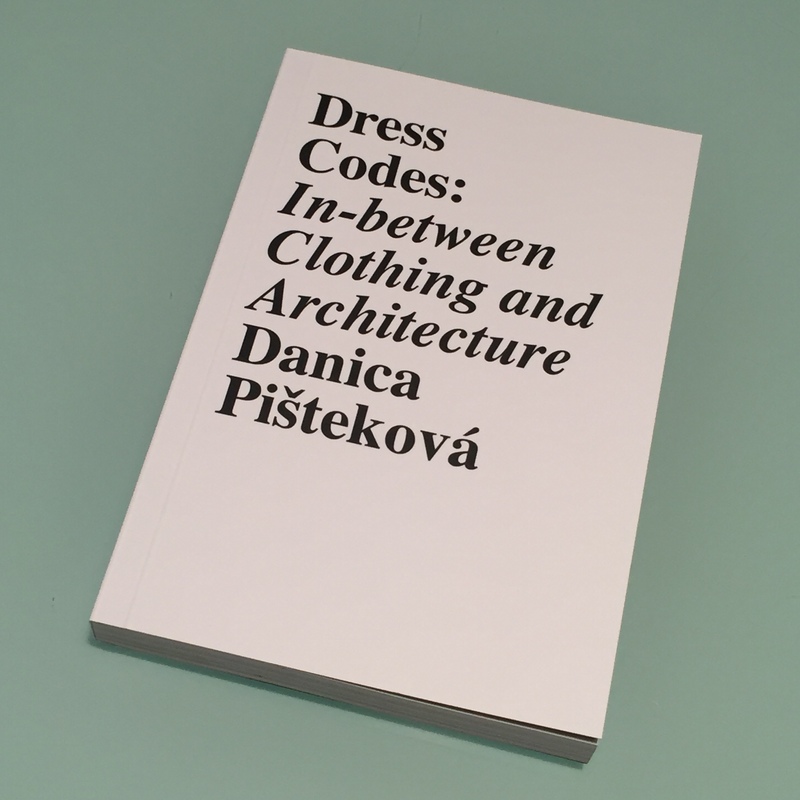 Danica Pišteková is an architect. She works with substance and void, manipulates space, sets rules for small parts of the world and thinks in systemic abstractions. 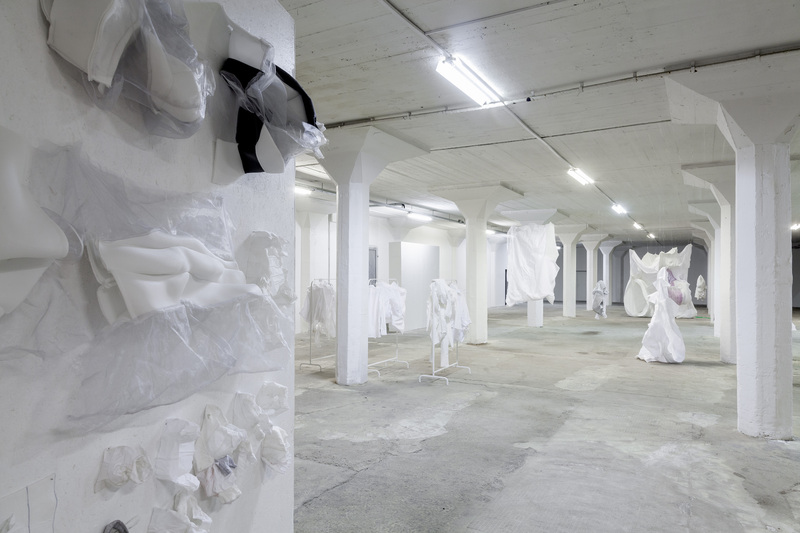 The structures she creates, however, are made of fabric and generally relate to the world of fashion. It would be pointless though to read these objects in a semantic way and look for their cultural context. Rather, their formal potential (affordance) develops naturally: the capacity of a cuff to copy the shape of a wrist, a collar to imply a head or a strip of buttons to connect two edges of a fabric whilst forming a volume. 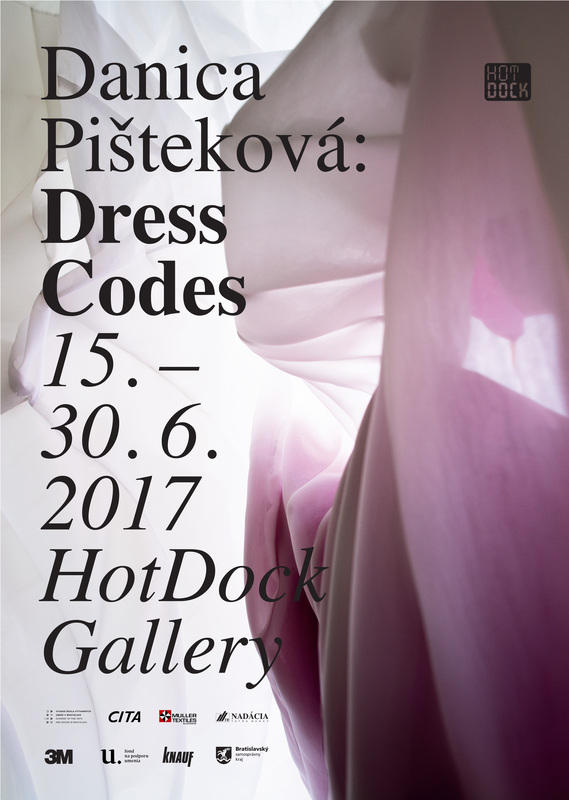 Danica Pišteková embraces, denies and deconstructs these capacities. 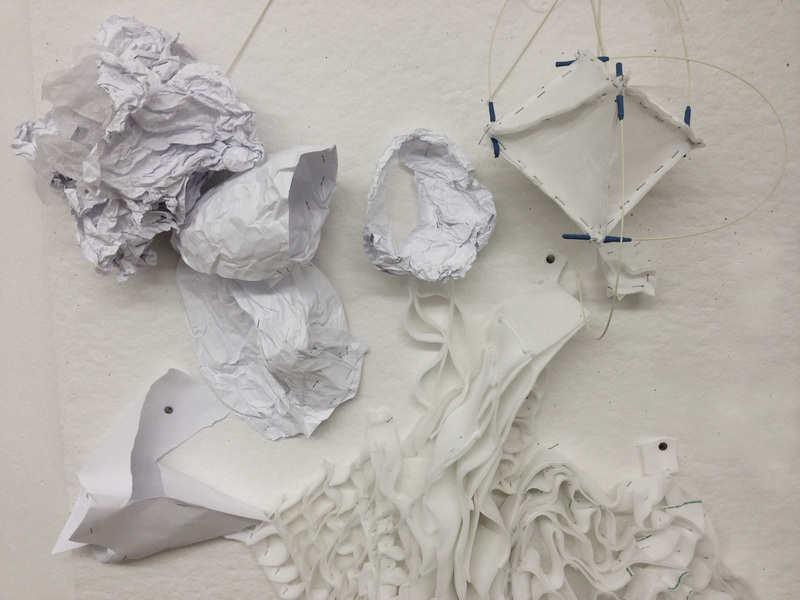 She takes apart pieces of clothing and reassembles them, replicating them and putting them into unnatural contexts. Well-known forms become alien, spatial relations become unclear and unexpected situations result in tension. 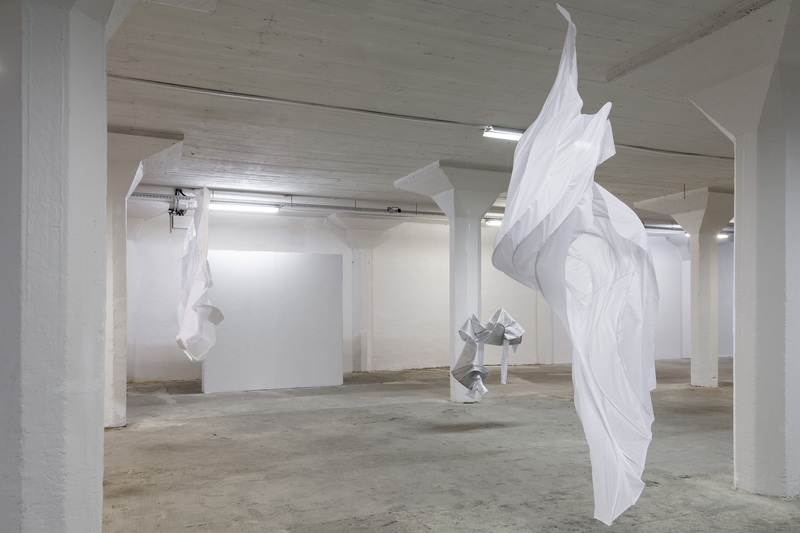 The complex aggregate of concrete and abstract textile forms and non-trivial topological relations is liberating: we must accept it as a refined aesthetic object sufficiently sound in form, structure and content to stand alone. Contemporary architectural discourse utilizes computational methods to tame complexity far beyond the invention of conventional authorship. While many works of today’s digital architects merely demonstrate the potential of such approach, Danica Pišteková achieves similar controlled complexity thanks to a personal creative agenda and works that are not prototypes. Her work is not dependant on digital tools, yet her piece Wall Curtain is a valuable addition to the emerging digital paradigm. 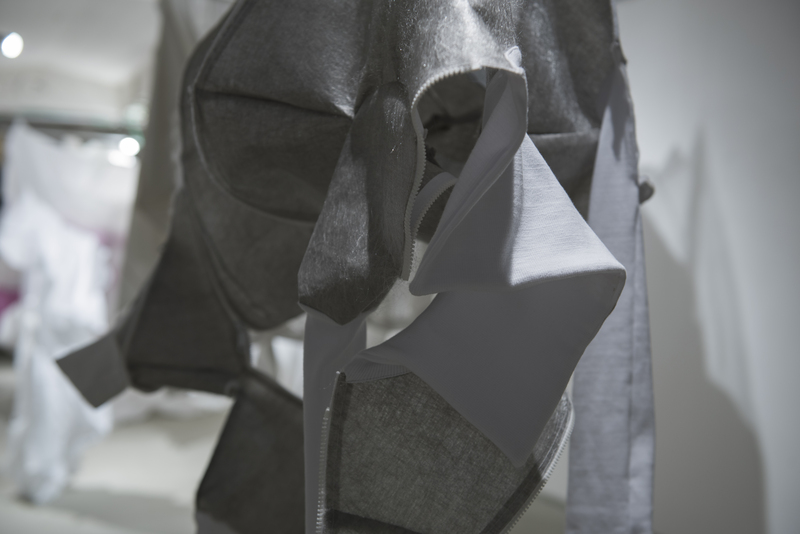 The precision design of complicated fabric elements and seams has created an artistic architectural object within the context of architectural thinking expressed through sewing. 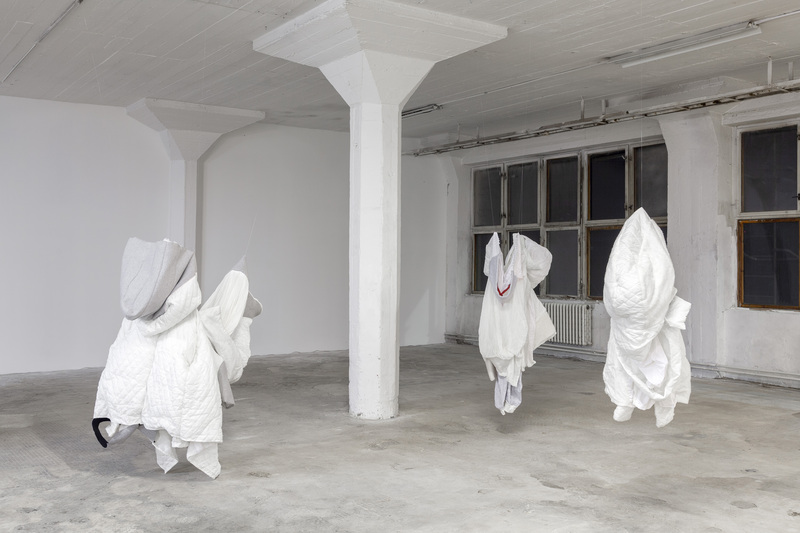 “One Size Fits All” combines two long-term artistic research projects of Danica Pišteková: Sewn as a Site and Diagrammatic Genealogies. 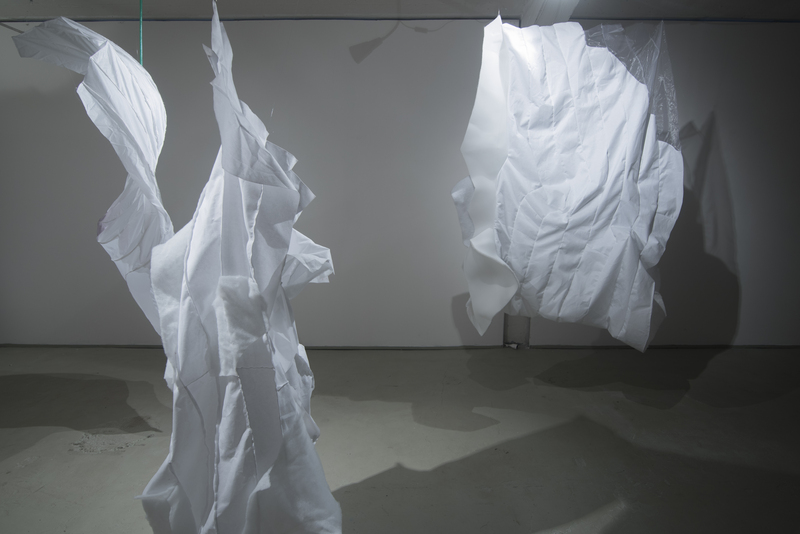 They both examine the space between body and clothing and speculate on the shapes, borders, colors, topologies and perforations of this in-between-space. 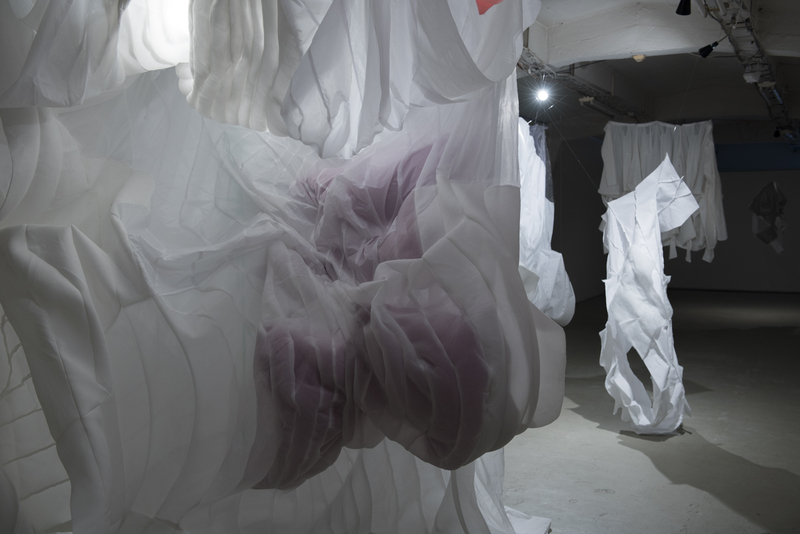 Soft semantics and materials give rise to complicated architectural forms that are worn as they wrap about bodies – human bodies as well as bodies of architecture. 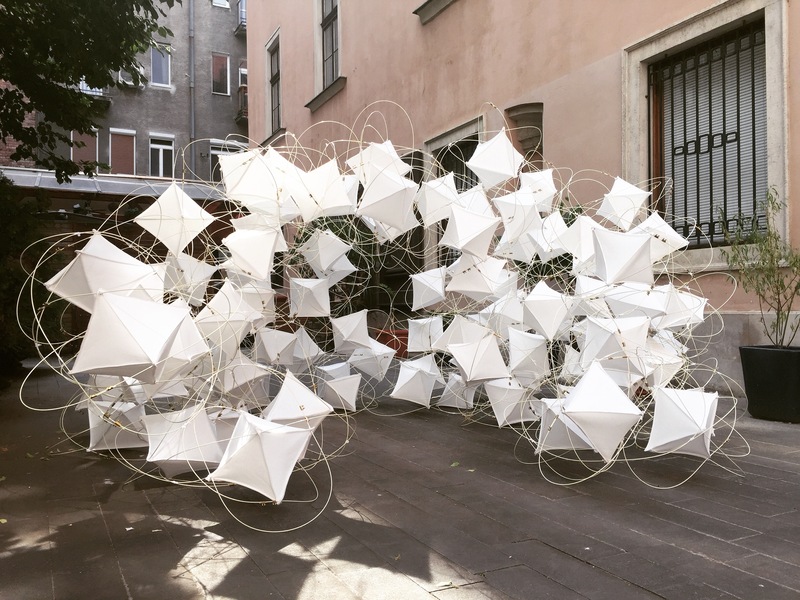 Nebulae is a research project created by students and teachers of Department of Architecture, Academy of Fine Arts and Design (AFAD) in Bratislava, Slovakia, within the subject Platforms of Material Prototyping led by Danica Pistekova and Kristina Rypakova. The interdisciplinary project investigates borders of architecture in 21 century, tests new materials (3D mesh spacer fabric, Glass Fiber Reinforced Polymer) and explores new design methods, from series of prototypes to evaluation in haptic and material fabrication in 1:1 scale. 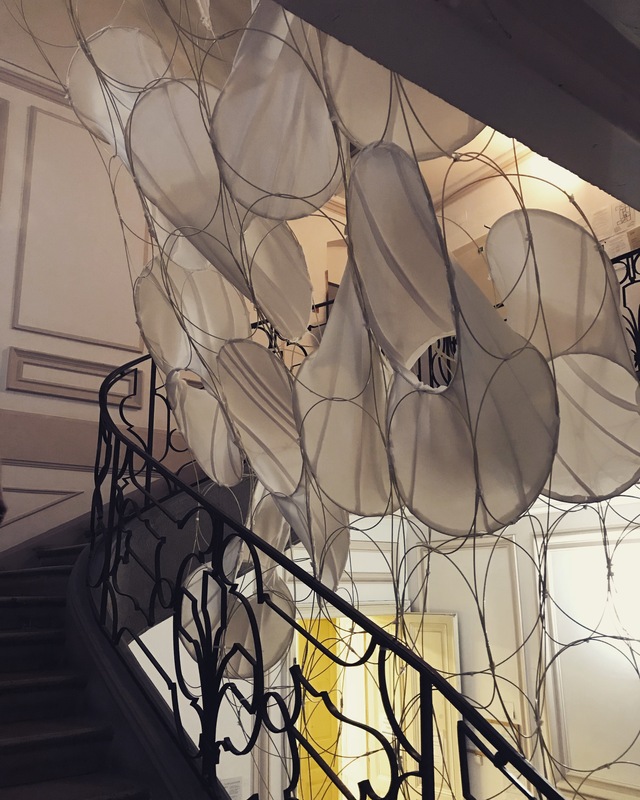 The resulting objects could be classified in a wide range of soft, analog woven cloud structures, unexact geometries, uncontrolled agregates or shaped trussing, where the skin and structure are not divided entities, but the partners in dialogue. the project was supported by AFAD and Muller Textile Slovakia s.r.o. 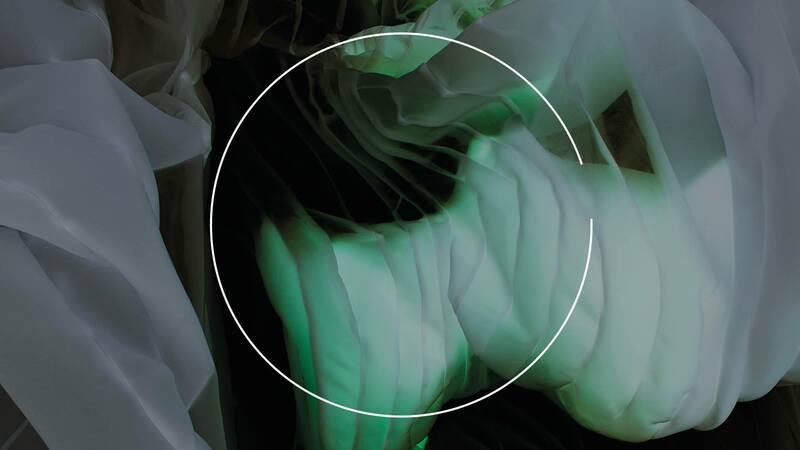 IWS project was developed with students of Department of Architecture at AFAD in Bratislava. 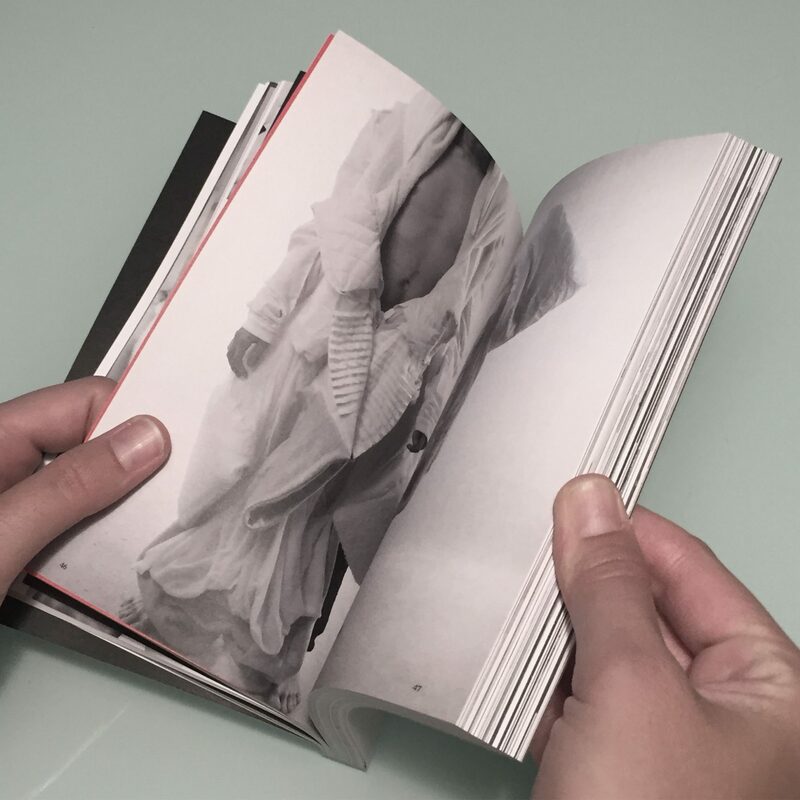 2017, 192 pages, 125 x 186 mm, The catalog was supported by Tatra banka foundation.